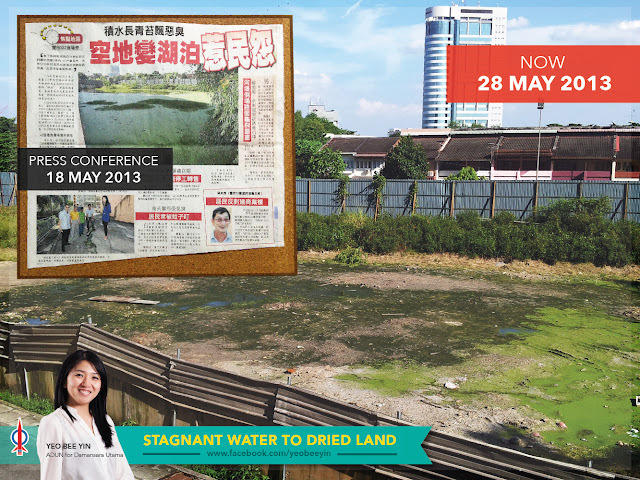 About 2 weeks ago we've received complains that an abandoned land near SS2 mall and Damansara Bistari has turned into a 'lake' - stagnant water that smells and a potential breeding ground for different diseases. So I did a press conference together with the residents, pegawai kesihatan from MBPJ and our councillor Lee Suet Sen on 18 May 2013. The land owner responded to the call and dried up the land. On the right is the picture of the dried land on 28 May 2013. To all the land owners, please make sure your land don't pose any inconvenience and potential health hazard to the residents around. Thanks.